One of our favorite things to do as parents is surprise our kids. We rarely tell them our plans ahead of time, especially when those plans include taking them out for a “special treat”. So, for example, we’ll have plans to stop at one of their favorite places – Sonic – for slushies. But before we leave the house, they start begging for a piece of their stale, 8-month-old, leftover Halloween candy. Since we know what’s coming, the answer is an easy, “No!”. Since they don’t know what’s coming, they think we’re the meanest mom and dad ever! They don’t understand that this “No!” is actually allowing them to truly enjoy one of their favorite treats on the planet. Sometimes we miss out on the best stuff because we’re too full of the mediocre. 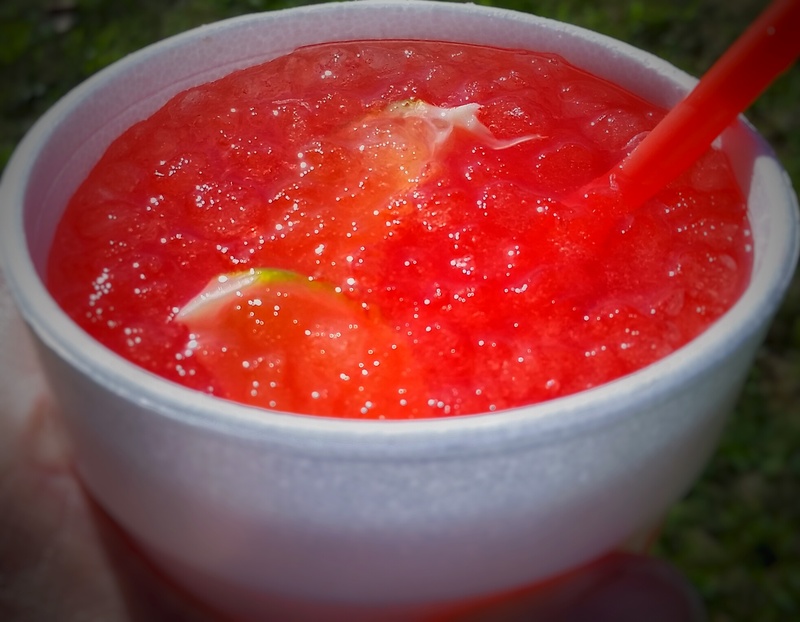 Now Sonic just happens to also be the home of one of my favorite “special treats” – Cherry Limeade. I just can’t get enough of that tangy, sweet flavor! Every time I get one, I drink it nice and slow because I want it to last as long as possible. The advertisements and photos make ice cubes look so appealing. They look like they are going to make your drink so much more refreshing and filled with awesomeness! But in the end, all they do is water down the good stuff. Thousands of years ago, as part of His plan to rescue humanity from the mess we’d gotten ourselves into, God chose a family – which became a nation – to become His people. In other words, they didn’t need to fill their lives with the ice cubes of jealousy or the desire to take the things other people had. They didn’t need to work and work and try and try to get ahead. They were in the hands of the Owner of the universe, the Creator of it all, and He had repeatedly proven to them that He would care for them. They already had everything they ever needed in Him! They didn’t need to fill their lives with the ice cubes of lying to protect or build themselves up. They didn’t need to use His name to buff up their image or get attention. They didn’t need to strive and fight to get above those God had put in authority over them. The Sovereign, all-powerful God had a perfect plan for them and they could trust that He was working in every circumstance. They could trust that as His precious children, they were already becoming everything He had planned for them to be. They didn’t need to fill their lives with the ice cubes of bitterness or rage when they had been wronged and they didn’t need to fill their emptiness with misplaced intimacy. Their Father’s love for them was complete and completely fulfilling and He would be faithful to heal their every hurt. And they didn’t need to give their time, energy, passion or devotion to the idols of this world – to the ice cubes of status, wealth, comfort, achievement, or control. They didn’t need to elevate anything in this world to first place in their lives, thinking He wasn’t enough. He was enough and the satisfaction He was offering them was infinitely greater than anything they could find elsewhere. Today, thousands of years later, we, as His people and His dearly loved children by our faith in Jesus, are faced with the same choice. 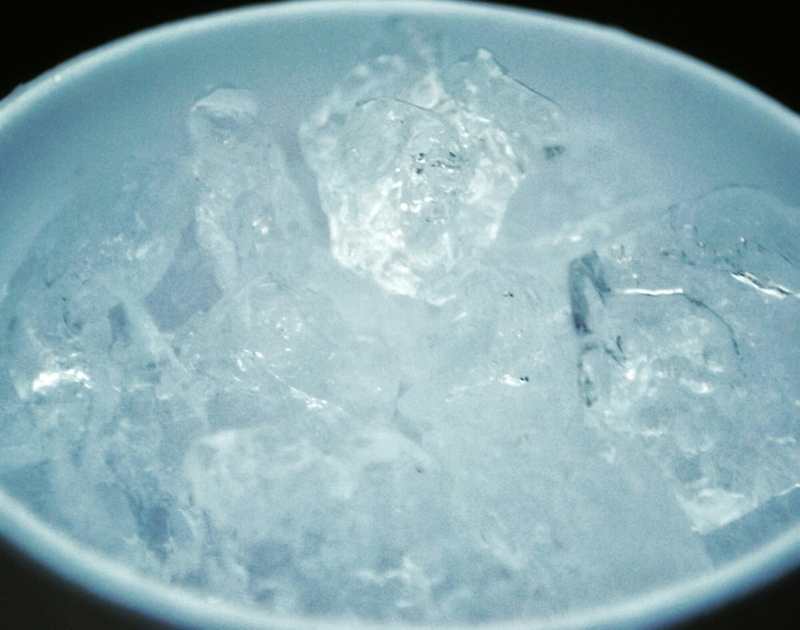 The ice cubes of this world look so appealing, but they’re still the same old mediocre junk, so my good, good Father has given me a firm “No!”. 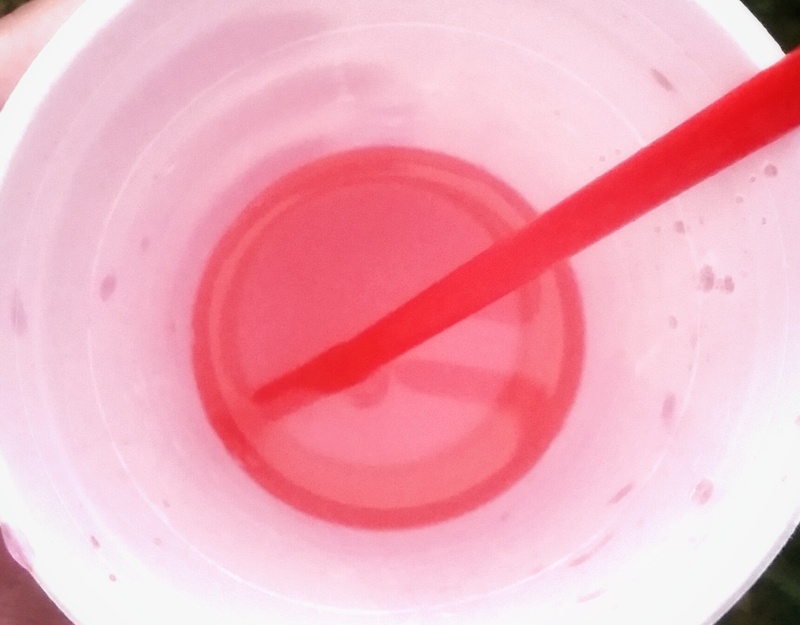 Because there’s only so much room in my cup. And all those ice cubes do is take the place of the good stuff, and in the end, melt and leave me with a watered down relationship with Him. He really is the good stuff. Actually, He’s not just the good stuff, He’s the BEST STUFF EVER. He’s the special-est treat of all special treats. And He’s offering me – and you – completely unlimited refills. I was not born to be a runner. It may be my “athletic activity” of choice, but only because it’s all this clumsy, uncoordinated body of mine can manage. At times, even the simple exercise of quickly putting one leg in front of the other can be a little too much for my awkwardly-outward-pointed feet. Run or sit? Run or sit? Sit. This year, our friend Sid convinced me to run a 5K in Philadelphia. I knew this would be way out of my league, but, hey, why not? I was a little nervous as the race began, but my pace was good and I seemed to be passing people left and right. My confidence level was soaring! But less than a mile in, reality hit me. Hard. I had started out way too fast, it was a hot day, everything in my body felt like it weighed a million pounds, and I just wanted to stop. And then I looked up and saw the race leaders, floating by me with smiles on their faces, already on their way back toward the finish. Ugh. In spite of being sure I was going to die if I continued, I pressed on and made it to the finish line, glancing over at a time of around 27 minutes as I passed the clock. 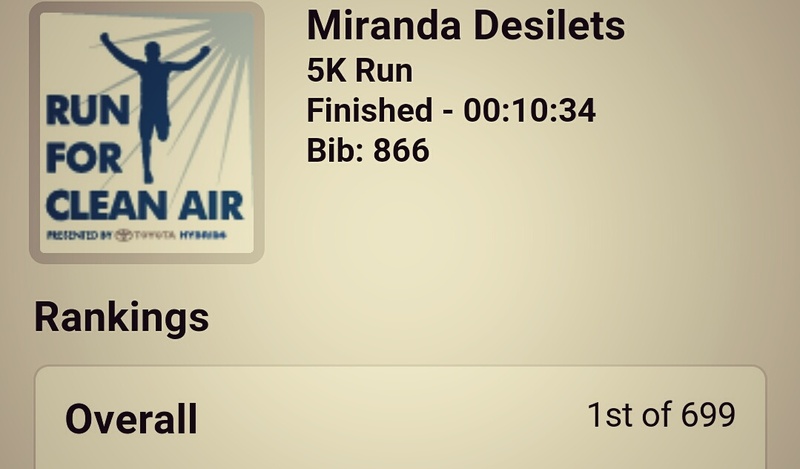 Not my best time, but not bad! Yep, that’s me. 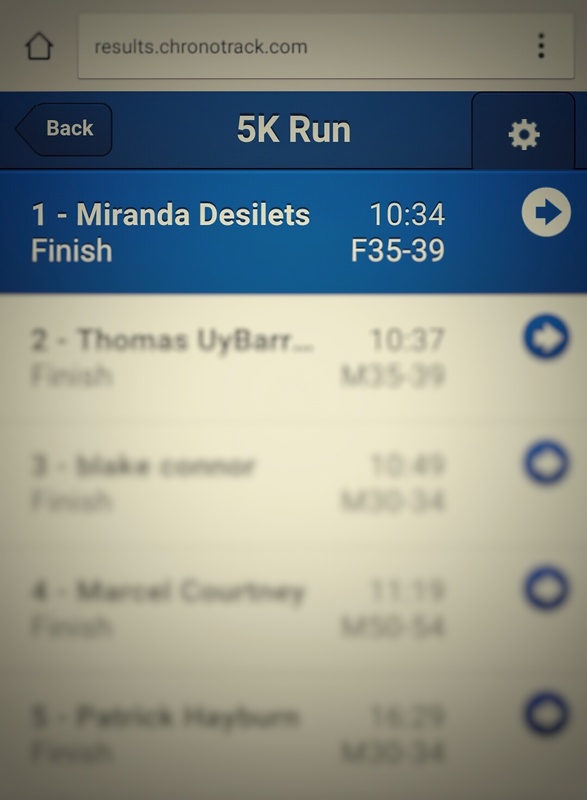 First place overall, 1st out of 699 with a time of 10 minutes and 34 seconds! Obviously this was a glitch, but I thought it was hilarious, so I turned to Sid to celebrate my victory! The timing official, however, was not so amused and proceeded to bring me to another booth where they tried to convince me that I had cheated or somehow run the wrong race. I was a world record-holding celebrity! It was my 15 minutes of fame. And because of that, I struggle. My selfish nature causes me to struggle with God, with others, and even with my own self. With the right advice, training and equipment, I may be fairly successful for a short burst of time – but it’s always hot out and I will always hit that wall. Hard. And the weight of my sin will feel like a million pounds. But, there’s this guy ahead of me, leading the pack, already on His way back. In fact, He already crossed the finish line. He then willingly went to the cross, taking every ounce of my selfishness upon His shoulders, so that something amazing could happen: So that I could walk up and type in my number and see His perfect, world record setting time – with my name on it. His gold medal gets put around my neck. Not because I tried really hard. Not because my good deeds outweighed my bad ones. Not because I was better than “those other people”. Not because I succeeded in any way or because I ever will. But simply because I heard Him call my name and I walked up to the podium, bowed my head and accepted it. There are many days where I hear the voices of doubt and the feelings of defeat trying to tell me that this can’t be true – I must be cheating or somehow trying to run the wrong race! And so many times I want to cry “Unfair!” – because how could it be? But I’m reminded over and over again that grace is not something I could have ever earned and nor is it something I can ever earn more of. The race has already been won and now, instead of focusing on my losses, my failures, or my flaws, it’s simply time to celebrate the victory I have been given in Jesus. And this time there’s no glitch. We sat with our life jackets buckled, paddles in hand, and minds filled with excited (and maybe a tiny bit of nervous) anticipation as a Nantahala River Guide gave us our official instructions. It was finally “rafting day” of our North Carolina vacation and even though almost everyone in our group had done this before, it was good to get a refresher on the basics: like how to hold the paddle (T-grip only!) and where to sit (“Crack-on-crack”, of course). But it’s in those desperate, weak and sinking moments where the Helper – the Holy Spirit – goes to work. That’s where, like that life jacket, He begins His job of propelling us upward. It may go completely against our human instinct, and of course the Spirit’s work is not limited to us being “down”, but sometimes that extra “dunk” is exactly what allows Him to propel us right out of the pit! Walking through the ford was breathtaking – and not just because the water was freezing! It was just such a unique and refreshing feeling to plant your feet in a spot in the middle of the road and let the stream flow over and around them. I’ve never been the sharpest tool in the shed when it comes to “getting” things. In fact, many obvious (to the general public) things seem to fly right over my head. “Duh!” was a word that got thrown in my direction more than once (okay, a lot more than once) as I was growing up. It may not be what the “cool kids” say anymore, but since my ability to “get” things hasn’t improved all that much, I still hear it in my head on a regular basis. Like a few weeks ago when Tim and I were walking with our three girls. 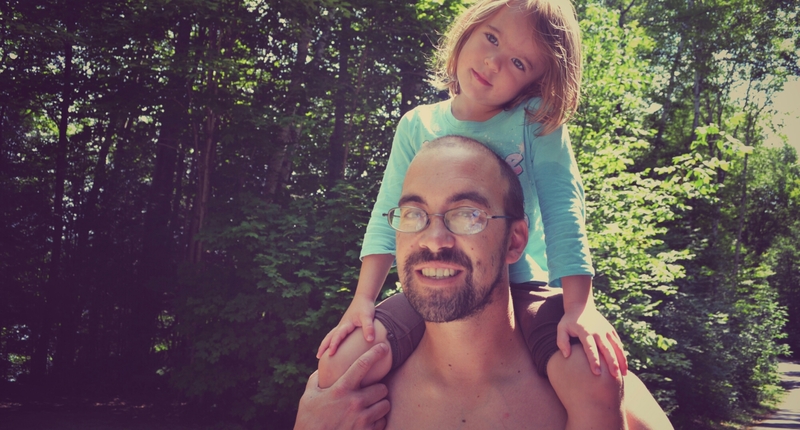 Our youngest, Anna, was “too tired to walk another step”, so her Daddy picked her up and started carrying her on his shoulders. As we walked along, having a lively discussion about our summer plans, I looked over at Anna and noticed that instead of using her arms to hold on to Tim, she was using them to tickle his ears and to turn the top of his head into a drum. I smiled for a brief second at the cuteness, but then my joy turned to panic. Oh my goodness, she’s not holding on to him! She could fall! DUH! Tim is a good dad! Why in the world would I ever think that our three-year-old’s ability to stay safely on his shoulders depended on her? The problem was that I just couldn’t see it. From my limited perspective a few feet behind them, I could not see his hand gripped tightly around her leg, keeping her securely on his shoulders, no matter what her arms were doing. So often this very same limited perspective occurs in my relationship with Jesus. And maybe this happens to you, too. We pray. We ask. We wait. We expect. We want to see God work in our lives. We want to feel God working in our lives. Unfortunately, what happens ends up looking more like this: Let’s say we ask for peace. Then, when we do not feel peace the way we expected to feel peace, we say, “God is not working in my life”. But, duh! Do I really need to see or feel something to know it’s happening? The truth is, I rarely just feel God. Rather, I know what He has said in His word and I trust that He is faithful to His word. Which means I know that He is with me. Which means I know that His Spirit is working in my life. And therefore I feel Him. I already have the peace I am asking for. And the funny thing is that when I remember and acknowledge that simple truth (duh! ), I then feel the peace. Whether or not you see or feel it, THAT power is at work in you. In his notes on the miracle of the resurrection, Charles Spurgeon remarks at how blind the religious leaders and so many others in that time were in not believing that Jesus had risen from the dead. If we believe that God had the power to raise Christ from the dead – how can we not believe and trust that He is still using that very same power in our lives, even if we can’t see it? I’m so glad our God is not a cool kid standing there holding His hands up, staring at me and saying that dreaded word. Yes, it’s all so obvious to Him, but He knows that we don’t always “get it”. And He never gets annoyed with us, never condemns us, and never tires of patiently leading us by His Spirit into all truth. Whether we feel it or not.